This fall, Red Oak High School is very excited to begin our new ProStart culinary arts program! ProStart is a program created by the National Restaurant Association Educational Foundation (NRAEF) and supported by industry members, educators, the Iowa Restaurant Association Education Foundation, and the NRAEF. ProStart was developed to teach students culinary techniques and management skills with real-world educational opportunities. The program is perfect for students who plan to directly enter the workforce and also prepares college-bound students for further studies in culinary arts. Students entering the ProStart program will be required to complete a Food & Nutrition class to prepare them with basic skills and will include ServSafe’s Safe Handler certification. Students continuing into ProStart will learn food safety best policy through the ServSafe Manager program and have the opportunity to take the exam for certification. Iowa code requires every food establishment to have a certified food protection manager on staff, so this opportunity allows our students to get a head start in the industry. The Red Oak Community School District Board of Directors invites proposals to partner with the District by operating a Child Daycare facility to be located in the current Washington Intermediate school building, 400 W. 2nd Street, Red Oak, IA 51566. The District contemplates that a “lease and use agreement” will be negotiated between the Parties spelling out lease terms and operational responsibilities. The Washington school property is expected to be available for necessary alterations to accommodate the Daycare use by August 1, 2019. To view the property or discuss potential interest, please contact Supt. Tom Messinger at the school administrative office, telephone 712-623-6600. Proposals must be submitted at the Red Oak Community School District Business Office, 1901 Broadway Street, Suite A, Red Oak, Iowa by noon on Friday, May 10, 2019. Prospective interested parties will present their business plans for development and operation of the property at a Board meeting to be held on the 13th day of May, 2019 in the Red Oak Inman Primary School Media Center at 7:00 p.m. Submitted proposals should remain valid for forty days from date of submission. The Board reserves the right to reject any and all proposals and to negotiate further with any bidder or bidders and to select the bidder it deems in the best interest of the District and the Community which may not be the highest financial bid. The Board is interested in a long-term partnership which will add value to the Red Oak community and benefit the District. The Bidder must submit a detailed written proposal and be available to present this proposal and answer questions about it at an upcoming Board meeting. The proposal shall include but shall not be limited to: plans for renovation or alteration of available space for Daycare operations, timeline for implementation of its plan, project financing, prior experience relating to Daycare operation and any proposals similar to the proposed use, licensure or projected licensure from applicable regulatory authority, identification of key, experienced staff, preliminary fee schedules, expected staffing numbers, and any other factors the Bidder deems important. The School Board hopes to choose the proposal and bidder which it wishes to work with in negotiating a mutually agreed lease and use agreement at the Board meeting to be held May 13, 2019 or within thirty days thereafter. Congratulations to the Red Oak 7th & 8th grade teams on their continued success at the Southwest Iowa Battle of Books competition in Harlan, Iowa. Red Oak had two teams qualify for the Ultimate Challenge Qualifier. Taking second place honors today was the team of 8th grader Michelle Grass, 7th graders Sam Fields, Jonah Wemhoff, Abby Johnson, Cataya Barker, and Lainey Klepinger. Also competing in today's competition were 8th graders Lainey DeVries, Tessa Rolenc, Josie Rengstorf , Bella Glassel, Ashley Wilkins, and 7th grader Cyrus Mensen. 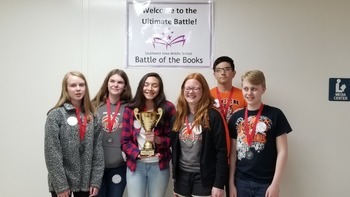 On Friday, March 29 at the Red Oak Middle School auditorium the second year of the literacy competition of the Red Oak 5th and 6th Grade Battle of the Books was held. Competing in this year’s battle were eight area school districts totaling 76 students, making up 15 teams. The districts attending were; Red Oak, Atlantic, Harlan, Logan Magnolia, C.A.M., Southwest Valley both locations of Corning and Villisca, Shenandoah, and Fremont Mills. A Battle of the Books begins with every team assigned the same 20 books to read before the competition day. Each year a new book list is given to each teams coach at the beginning of the school year. A team is made up of three to six members. Teams prepare for the competition by having book conversations together and writing practice comprehension questions for their teams. All questions begin with “In what book did…?” Battle of the Books is a great way to expose students to a variety of reading genres, collaborating with others and appreciating the knowledge and skills of others. It provides an opportunity for students to meet and work with others for the first time. And more importantly the fun and adventure discovered in reading. Taking first place honors this year was Harlan’s 6th grade team “The Cyclone Readers”. Team members are Sabre Schmitz, Aleric Schoonover, Katy Schmitz, Gianna Sampson, Kaynen Urbanec, Erin Herzberg. The Harlan team is coached by Mrs. Mary Renkly. Second place was awarded to Southwest Valley’s Villisca’s “Colorful Monkeys”. Team members are; Oakley Benge, Ava Bardole, Grace Nippert, Kailyn Pritchard, Mackenzie Fast, and Ella Finical. The Villisca Southwest Valley team is coached by Kelsi Bruce. Placing third was Shenandoah’s “Dreamy Teamy”. Team member are Summer Maher, Emma Baldwin, Brooke Hays, and Drew Morelock. The Shenandoah team is coached by Kelly Carey. Red Oak had two teams competing in this year’s battle. Red Oak’s 5th grade team “Red Oak R.O.C. (Running out of Chapters) finished in 5th place, team members are Zoie Rohrig, Mylee Echternach, Santiago Vasquez, and Sianna Klepinger. Red Oak’s 6th grade team “The Mysterious Fellers Society” finished 7th, team members are Abby Pedersen, Grace Goldapp, Nevaeh Sore, and Marissa Williams. Both Red Oak teams are coached by Trish Fellers. 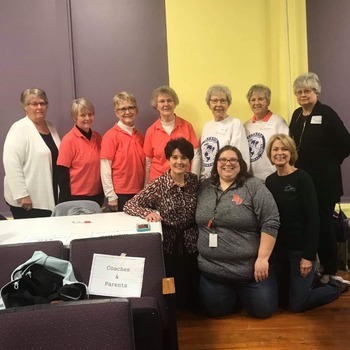 A very special thank you to the wonderful ladies of the Red Oak Altrusa Club for their generous volunteer help in this year’s competition with scoring. The Red Oak Altrusa is an advocate for literacy and provides and supports numerous literacy projects throughout the Red Oak community. It was a great literary battle and each school district should be proud of their school representatives on how hard they prepared for this competition and on the outstanding job they did representing each of their school districts. The Red Oak Community School District enables itself to provide the best opportunities for all students to academically, socially, and ethically prepare themselves for global citizenship.